I've still not been swept up in the Harry Potter hype. I'm not much of a wizards/witches/spells/magic type of person normally. But having read some good young adult fiction recently (e.g. 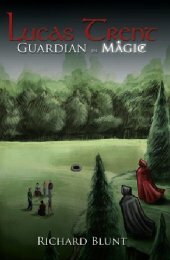 Malice and The Hunger Games) I decided to take a chance on new author Richard Blunt's Lucas Trent: Guardian in Magic. Lucas Trent is a sixteen-year old school student who has always been intrigued by the supernatural. One day he decides to take his interest a step further by joining a group dedicated to enthusiasts of the occult. This group meet at a local venue, and Lucas soon makes some new friends with the same interests. However, things soon spiral out of control (as things tend to), and Lucas and his new friends find themselves caught up in industrial espionage, secret conspiracies and mystical dark forces. This was an enjoyable read. As I mentioned earlier, this is not usually my cup of tea, but this was a fun book with a fairly sound message at its heart. There's a mixture of modern technology as well as "age-old" magic in here (a camera memory card plays an important role), and this is aimed at a slightly older readership than Harry Potter, so there should be plenty of people who will enjoy this. I just have one tiny gripe. The action takes place near Luton, which is described in this book as a city. I have nothing against Luton, several of my friends live in or around the area. But it's a large town, not a city. This may seem trivial but it's a mistake that didn't need to be made. Even Wikipedia has its facts straight on this issue. Anyway, don't let my pedantry put you off, this is an enjoyable "young wizards" romp for adults young and old.